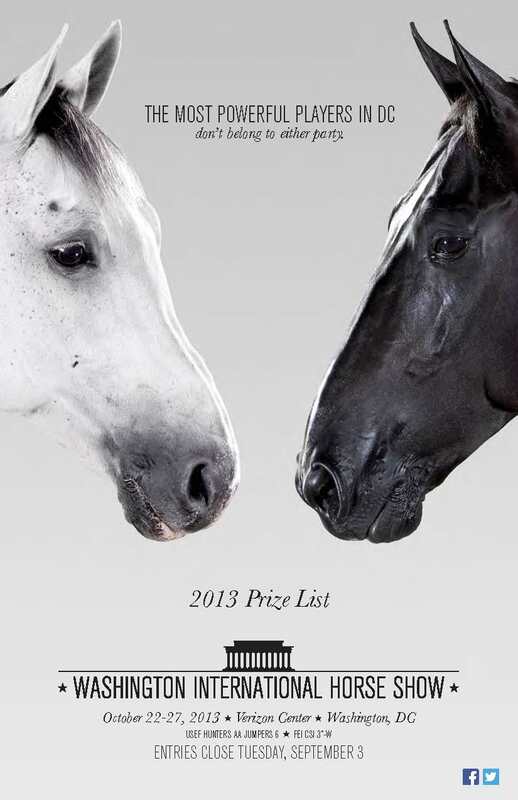 2013 WIHS Prize List now available online! Washington, DC – July 19, 2013 – The 55th Washington International Horse Show CSI 3* (WIHS) is pleased to announce an increase in the prize money awarded this year in the open jumper and hunter divisions. WIHS will offer nearly half a million dollars in total prize money in 2013, more than a $70,000 boost from 2012! The official prize list for 2013 competition is now available online at wihs.org/prize-list/, featuring some exciting new changes to the schedule. The country's only metropolitan indoor horse show, the Washington International Horse Show hosts one week of world-class competition each year at Verizon Center in downtown Washington, D.C., on Oct. 22-27, 2013. “WIHS has adjusted the open jumper division schedule and overall money to attract even more top riders around the world and provide an amazing opportunity for our more than 20,000 spectators to experience show jumping at its highest level,” said Bridget Love Meehan, WIHS executive director. The President’s Cup Grand Prix CSI 3*-World Cup Qualifier on Saturday evening will increase its purse to $125,000 (+$25,000). Friday night’s line-up will feature an exciting $50,000 1.50m Table C Faults Converted Speed Final (+$17,000) in addition to the $25,000 Puissance. Thursday's event will officially become a 1.50m Welcome Stake, a $33,000 class, which will be paired with the $20,000 crowd pleasing Gambler’s Choice Costume Class. Wednesday’s feature jumper class will remain an inviting $10,000 1.45m Time First Round. Olympic gold medalist McLain Ward is a regular competitor at WIHS and has won the President’s Cup Grand Prix three times. He is also vice president of the North American Rider's Group, which ranked WIHS as a Top 25 Horse Show last year. Higher purses are also offered in both the low and high junior/amateur-owner jumper divisions with an increase of $7,500. Prize money for the hunters has also grown by $29,000 and the high performance working hunter division will be featured with two classes on the opening night of the show, Tuesday Oct. 22, showcasing the country’s top professional hunters. WIHS will accept more entries this year in the amateur-owner working hunter 3'3” and the regional pony hunter sections, offering more competitors a fantastic chance to ride at Verizon Center. Cross-entry restrictions have been modified for horses and riders competing in the WIHS Children's and Adult Championships. As well, the entry process will be streamlined through the option of electronic submission through EquestrianConnect.com. Earlier this year, WIHS announced the extension of their agreement with Verizon Center through 2016, allowing the show to continue to feature equestrian sport in a high-profile media market and make it more accessible to new audiences. Sponsors benefit from participating in a fantastic sporting and social event, and riders get to compete in front of large, enthusiastic crowds in a city-center sports arena. 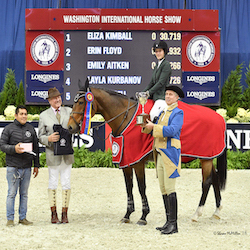 WIHS President Victoria Lowell reinforced the significance of these improvements for the 2013 competition, and she looks forward to welcoming top competitors from around the world to Verizon Center this fall. The WIHS has a venerable tradition of hosting the best horses and riders with a historical record of competitors featuring Olympians, national champions, many talented young equitation riders, and top-ranking junior, amateur, and pony competitors. The 2013 Washington International Horse Show anticipates another great year of competition showcasing top equestrian talent at Verizon Center. Find out more by downloading the 2013 WIHS Prize List. Entries close on Sept. 3, 2013. An equestrian tradition since 1958, the Washington International Horse Show is the country’s only metropolitan indoor horse show and the pinnacle of the equestrian year with top riders, including Olympic medalists, and their world-class horses. More than 500 horses participate in show jumping, hunter and equitation events during the six-day show, with many competing all year just to qualify. Highlights include the President’s Cup Grand Prix (a World Cup qualifier), the Puissance (high jump) and WIHS Equitation Classic Finals featuring the country’s top junior riders. Exciting equestrian exhibitions, boutique shopping and community activities such as Kids' Day and Breakfast with the Mounted Police round out this family-friendly event.